At the Governorship site, they repport the flag having 16 stars (one in the middle, the other 15 in circle around). The picture of the flag does not display. The description barely says that the flag is composed of two colors (green and white) and 16 stars (one in the middle and the other 15 around). Based on online magazine of the Colombian Police (pages 50 - 51). My image is a variation of the flag of the colombian departement of Caqueta. This Flag is also shown in an appendix to the constitution (about the mid-90). on <www.gobernaciondecaqueta.gov.co>, there is an new image of the flag of the departement of Caqueta of Colombia. Anyone knows when the change was taken? I don't think it is a new one. I can remember it from my last visit in this site few monthes ago. Note that in the same site there is the flag as appear on top. See: <www.gobernaciondecaqueta.gov.co/simbolos.htm>. In this one there is 16 Municipios (15 small stars and 1 large stars) while the upper one got 15 Municipios (14 small stars and 1 large stars). Who knows the development of the administrative structure in Caqueta? A star more, a star less. Once in a circle, then into an elbow. This will be the second variation, after another with the stars arranged in a circle. Most probably we are dealing with earlier proposals. It is not a flag proposal of Caqueta Province. In reality the number of the municipalities (municipios) changed from 15 to 16. At <www.derechoshumanos.gov.co>, 16 municipalities are represented in the departement of Caqueta. The municipality of Solita was again created in 1997. Therefore, the flag with the 16 stars is probably the current flag of the departement of Caqueta. 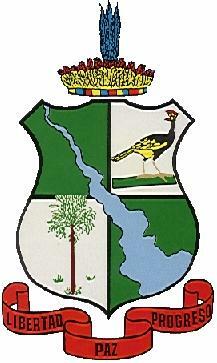 "El departamento cuenta con 16 municipios que son, según su orden de creación, Florencia (1902), San Vicente del Caguán (1950), Belén de los Andakíes (1950), La Montañita (1955), El Paujil (1967), El Doncello (1967), Puerto Rico (1967) y los municipios de Albania, Cartagena del Chairá, Curillo, Milán, Morelia, San José del Fragua, Solano y Valparaíso, creados en 1985. El último municipio creado es Solita que inicio su vida jurídica en 1997" .